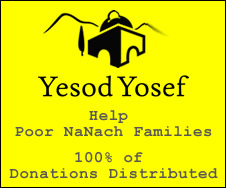 B"H it was started, I think, around 3 years ago, when some of our Nanach friends (principally Sagi and 'Boyya' of the Shomron) couldn't find anyone to put out the sforim for the right price, and with proper mention and attention to the Song of Redemption, Na Nach Nachma Nachman MeUman, so they started their own printing mission which they call "BaShaN" which I presume is based on the acronym, Nachman Ben Simcha, they started off kind of modestly (with only a few thousand...) and B"H may H"Y bless them infinitely more and more, they have developed into quite a mad publishing machine for over half a dozen holy books of Rabbainu - thousands of copies each. Their books are beautiful, durable, and are sold at rock bottom prices and very very often just given for free. They are just getting started B"H things look very promising. It is their belief that if we print in an appropriate quantity we can get the price of each book down so low as to be negligible, B"H.